It was four years ago this week that BY was to me just a face on the computer screen. What intrigued me were her vivid accounts of two kundalini experiences (she had no trouble naming them). I wish I could say that what I experienced was sympathetic joy or the curiosity of the expanding mind, but in truth what I felt was more like I WANT THAT. Peace, IMHO, is overrated. I’m not speaking of the cessation of war, which is the highest, most transformative social and political movement toward which we can work. I mean “inner peace”, by which we often mean “mindfluness-based stress reduction,” not to be confused with numbness. We want our sleep to be less troubled. But if that’s all we get from our practice, we’re selling ourselves short. Ecstasy - State of Wonder - Rapture - Cosmic Thrill - Explosive Joy - Abiding love - now that’s more like it! What I really want is not to dispel my anxiety but to transmute it into spiritual rapture. The reason enlightened people have an advantage is because they have become completely inebriated with the radiant nature of pure and abiding consciousness and know this fractal wonderland of WTF as themselves - thus there is no fear or bracing against unpleasant circumstances occurring to their person or body, since they have veritably transcended or seen beyond. They are easily and perhaps always immersed in the core intimacy of direct understanding that they are God - not as a willful or choice-burdened creator, but as the engine of creation, expressive dreaming, and awareness / sensorium of all permutation as a non-durational singularity. told me about meeting musicians in Rittenhouse Sq, getting to know them and inviting them home. Isn’t openness my credo? Isn’t it new people, new experiences and new ideas that keep me alive? And the day dawned 68 degrees with clear blue above. So I packed and got on my bike. For my haste to leave, I had but two regrets: I didn’t take time to plot out a Google Map route on small roads. I can take Easton Rd to Willow Grove, and from there York Rd = Rte 273 goes straight to the Pebble Hill Church where Night Sky gathers. The other thing I didn’t have time for was my headstand. So the bike ride wasn’t beautiful, but it was efficient. The most interesting thing that happened was about ¾ of the way there, beginning a straight, seemingly vertical stretch of road, I heard “On your left!” and a thirty-something sportster zoomed by with his razor tires and carbon fiber spokes. He wasn’t lean, but his calves meant business, and they flashed tattoos as he left me in his wake. Well, I’m not free of the Male Disease. I started churning the pedals, huffing and puffing. I stayed with him all the way to the top of the hill, and when he stopped for a sip of water, I couldn’t resist announcing, “On your left!” Yes, he passed me again a few minutes later, but I stayed within sight of him and his buddy until I turned onto Sugar Bottom Rd, off the highway and into the Night Sky. I made the trip in 92 minutes, about 4½-minute miles. I was pumped. I was much earlier than I expected, the doors were all locked with not a meditator in sight, so I found a soft spot of grass and indulged my 10-minute headstand after all. Jeff looks like a balding, middle-aged accountant. You’d never guess. The group was pretty tame, it seemed. But I’m here for an experience of wonder and mystery and bliss, and it is my expectation, my coming to meditation with this intention that will make it so. It was a good meditation. I have no complaints, except that I spent a lot of it writing this blog post in my head, turning present awareness into a story. I suppose there are worse things to do. Some time toward the end I had the thought: I’ve already had the experience I seek. I probably have this experience regularly, maybe nightly, and I don’t remember it. I don’t remember it because it’s not of this world. It’s a pure state free of thought and sensation, and I routinely forget it because it has no connection to the concerns of my waking life. After meditation, I was going to turn around and bicycle home, but Jeff extended me a personal invitation to join the group for breakfast in town, so I threw my bike in back of his van and accepted a ride. At breakfast, Jeff got to talking about This again. For improvisational poetry, it wasn’t bad. He found a hundred ways to knock us out of our ordinary, to remind us that there was a reality radically separate from the thoughts in our heads. We don’t dwell in philosophy or conjecture or abstraction, we simply go directly to the curious nature of present experiencing and peel it back to see its nature, to peer into the present evidence of the nirvanic/samsaric disposition of having no condition imposed upon us. That’s how you wake up, you just wake up, and wake up again; eschewing the predilection for turning unobtainable mystery into something you can have an opinion about. But there was, I thought, a disconnect between the form of what he was saying and the content. He wasn’t exuding joy and wonder. He was taking center stage, absorbing attention, dominating a group of 6 people sitting around a table. I couldn’t help wishing he would elicit his disciples’ personal truths and inspirations, instead of telling us what to think. Sigh. This is what’s wrong with men, you know. I tried a couple of times to subvert the protocol, to get us away from the classroom model where the teacher lectures and responds to questions, addressing one student at a time. But I got the impression that others around the table were comfortable with what they were getting, and it’s what they came to breakfast for. I quietly slipped over to the cashier and paid everyone’s tab. (It wasn’t a gesture of generosity so much as a reminder about random acts of kindness and senseless beauty.) Jeff interrupted his lecture to say good-bye as I put on my helmet and backpack. I thanked him for his poetry. I figured out how to delete the updates to G-Map, and on the way home, I followed the voice directions for bicycle. G-Nav took me way west of the route that I had travelled earlier. She introduced me to a bike path along the side of Rte 202, which was new and smooth and just a bit too close to the traffic noise. She kept me mostly on shady country roads and off heavily trafficked commercial routes. She slipped a bit at the end, I thought, dumping me onto Bethlehem Pike for the last 7 miles into Philadelphia. This isn’t quite as awful as it sounds, because this stretch of the Pike is parallelled by Rte 309, a limited-access highway that relieves most of the fast, long-distance traffic. Nevertheless, it was less fun than the rest of the trip. Approaching Philadelphia, the Pike climbs 300 ft straight up to the city line, with buses and cars too close for comfort as I’m hyperventilating up the hill. G-Nav offered Montgomery Ave as an alternative, but by that time I knew where I was, I knew the straight route through Chestnut Hill, and I didn’t trust that I wouldn’t be taken far out of my way. Now, consulting the map, I see that it looks like a less-traveled road that I didn’t know about. Next time, I’ll try it. I’ve been a big fan of GPS navigation since it was first offered in my Verizon dumb-phone 6 years ago. Unless you’re a programmer, you probably don’t realize how much harder it is to find the best bike route than to find the best car route. For cars, the algorithm is to steer you from wherever you are to a major road that goes in the right direction, then to get you off the highway at the nearest exit, and to guide you on smaller roads to your destination. There are many more options to choose from if the goal is to use the smallest possible roads rather than the largest. In fact (even more esoteric), it’s a famous unsolved problem from theoretical computer science to find an efficient routing algorithm for the general case. I think my idea of enlightened bliss is a little more rooted in my body and my mind than the one that has been presented to me. I figure I’m on this planet, incarnated in this form for a reason, and there will be plenty of time for the more abstracted version of samadhi when I’m dead. But maybe that’s just the male ego talking. I wrote to Jeff and asked if he ever puts out his poetry as poetry, and sent him the most relevant expression from my own slim poetic output, a piece that was written 3 summers ago with advice and very helpful suggestions from BY. Shed fear. Sprout wings. Leap out from arbitrary time. Transmute the ordinary; prospect the sublime. Senses sparkle, shutters from their hinges fly. I remember my first time. It felt a little risky, but then I gave in to the burst of joy and thought: I’m gonna keep doing this! No, not that…I’m talking about riding my bike with earphones, letting upbeat music help me sail along the path, time flying by with the miles. And so, for several years now I’ve used music as a biking companion – first the playlists on my I-phone and then the happy discovery of Pandora. Even though I always keep the volume low enough to remain aware of other sounds, I’ve had a nagging feeling that it’s not really safe to ride with earphones. So I was excited to try out the Tigra bikeconsole, especially since I got it free of charge from bike2power to review. (There, full disclosure.) I requested the I-phone 4 case and here’s what I found. The waterproof case slides easily on and off the compact handlebar mount, although I had to take the mount to a bike shop because I couldn’t figure out how to attach it to the handlebars. I confess I have zero mechanical ability, confirmed when the friendly young cashier at Big Wheel Bikes in Arlington looked at it, puzzled for a moment, and then proceeded to attach it in about 60 seconds – no charge. On Tuesday I biked to work, I-phone securely encased in the bikeconsole. My initial concern was whether it would go flying off when I hit one of the many bumps on the Custis or Mount Vernon trails (those pesky tree roots!!) But it held steady – no worries. The sound volume, however, was a challenge. Once the case is closed completely, it muffles quite a bit of the sound, and I had to set the I-phone to its maximum volume. It was adequate for quieter parts of my commute, but much of my ride is near busy roads – and then I really couldn’t hear a thing. Even though I know my way to work, I decided to try out the bike navigations apps I have on my phone. First I tried BikeNav, and – so long as I wasn’t in direct sunlight – I could easily read the turn-by-turn directions while the phone was held in the mount. Also, the phone’s touch screen operated perfectly through the case. But, to my annoyance, a message quickly appeared on the screen asking whether I wanted to “cancel keystrokes.” I switched to the BikeRoute app: same problem. Apparently the little bit of jiggle while the phone is in the case upsets the sensitive feelings of these apps. Still, if I was in a situation where I really needed directions, I would keep “canceling” the message and appreciate having the phone mounted where I could read the directions. For the last third of my ride, I turned to Strava – an app that calculates time, speed, and distance. Although I’ve had the app on my phone for several months, this was the first time I’d used it. I’m now in danger of turning into a stats geek – as I delighted in watching my speed, mileage, and time on the display. On the way home, I received a phone call while I was on the Pennsylvania Avenue cycle track. I was able to answer my phone call, put the phone on “speaker” and have a short conversation while riding, then returning to my music. I was rather astonished that even in the midst of traffic I was able to hear and be heard. I used the bikeconsole again on Friday, this time with headphones. The device has an earphone opening, so I suspect it’s intended to be used this way. I also tracked my ride on Strava, discovering, to my pleasure, that I average about 12.5 miles per hour – even with traffic stops. So I’m not such a slowpoke as I’d thought (though hardly a speed demon). On the way home I decided to try music through my I-phone’s play list, rather than Pandora – wondering whether the volume would be adequate without earphones. Sadly, it wasn’t. Later I looked at the bikeconsole box and, reading the fine print, noticed that one can attach a “nano speaker” to listen to music without headphones. However, when I searched on the Web, I didn’t find anything that looked compatible. I might try a visit to the Apple store or a bike shop, since I expect to use the console regularly. 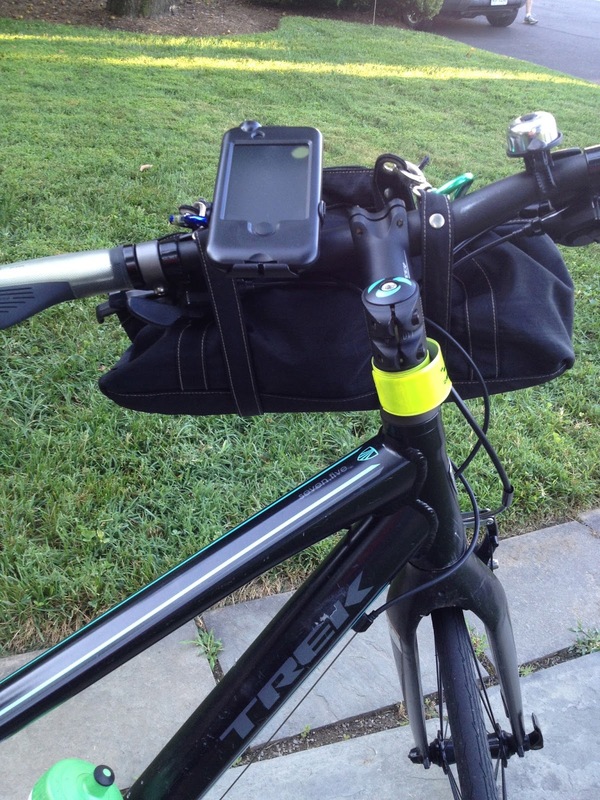 The bottom line: bikeconsole is easy to use, holds the I-phone securely, and is a convenient device, both for navigation and music. I probably will continue to use earphones but I may try out a speaker, if I can find one at a decent price.